has the camaro been sent to the car crusher or you got another one? We stripped just about everything off of that poor car, and them I had the shell hauled away about 2 months ago. Had to get rid of the thing, it made my back and neck hurt when I looked at it. I have seen documents saying that the polo green heritage package was only offered on 1992 RS camaros. I did not realize this until I saw JT's post about heritage packages on 05-20-2010. Also according to compnine there were only 40 Z03, 45u (med. green met.) covertible camaros made. so that makes mine rare, but is it at all desirable to anyone but me? It also came with leather RPO 642 and CD player U1C so compnine says 1 of 14. Any thoughts, I realize it's only an RS and only an L03 auto. The only V8 available in the regular RS was the L03, so you got the best available there. The color, leather, convertible, etc all make this a desirable car. Even if it is an RS. I looked at one almost identical in 1993 at a used dealership only it was a TTop car. The dealer wanted $14k at the time. It was a Heritage car also and looked very nice. Enjoy the car. I also have a 1990 (12/89) according to the door. I love this website, I just went and checked. I have a 1990 (isn't on any of the lists) but we are curious about it. We have owned is since 1998. It is maui blue, t-tops, 305 v8, LO3, all power. It has 90,000 miles on it. I have tried to research how many were made and can't seem to track it down. Any info on this car would be appreciated. Thank you! Thank you!! That was a great website. I was already on there from a link that I found on here, but didn't realize you could put your rpo's in. From what I put in, there were supposedly (sp) 300 of mine made. Great to know. Thanks again! I just used that link for rpo check and was surprised to whittle it down to 1. Answer: Of the 3,863 vehicles in our database matching the year and model, 1 have all of those rpo codes. got me thinking how much different the cars that looked like mines were with alternative options. It was too easy to get it that low. I'm guessing my car is not that rare. That's because you have a Canadian vehicle. It isn't until 1990 do they have nearly complete records for both Canadian and US. Any vehicle prior to 1990 is basically isolated to the Canadian market - which is a slim amount of overall production. So, your example, they have a total of 3,863 VINs for the 1984 Third Gen Firebird Trans Am. That's substantially less than complete, which is why you aren't getting an accurate gauge as to how common your 1984 Third Gen Trans AM is. I knew it was too easy. Honestly even when you look into the 1990's which is the only complete year, the data is rather interesting. The fact is you may have one of 3, but why? There may be hundreds of cars out there that are technically identical, but for the RPO codes. It appears that there are several RPO's that actually indicate cars that were made either in the first week, or second week, or 51st week etc, Then you have several RPO's for Fleet vehicles, or whatever that acutally take the car down in number... Interestingly I would not be surprised to find that if you take the 1989 TTA's, there are probably more of those cars that are identical than any other model for any other year. There were only a limited number of options on the TTA, They were All white, they all had the same color interior, the only options was T-tops and Leather... and 3 were made into a convertible, There may have been some other little options, but thats about it. Interestingly I would not be surprised to find that if you take the 1989 TTA's, there are probably more of those cars that are identical than any other model for any other year. There were only a limited number of options on the TTA, They were All white, they all had the same color interior, the only options was T-tops and Leather... and 3 were made into a convertible, There may have been some other little options, but thats about it. There were 14 additional Regular Production Option Codes for the TTA's. Not counting the Leather, Cloth, Hardtop or T-Top RPO's. Such as California Emission Requirement, State of New York Waiver, Box-Storage Cassette Tape and the other 11. These RPO's varied from 1 to 897 of the number of cars that they were assigned. is an 85 camaro with the quartz clock technically rare only 809 had them but id assume most base models got them and i got an iroc so i wonder how many irocs got em. also is there a count on how many had l/s interior? Rare... maybe, desireable... who knows. I do not think at this point in time anyone would be going out of their way to find a Camaro with a Quartz clock... It would be a take it or leave it option, Its like an AM radio in 1989, they were made, but who really wants it? It would depend on the buyer. This car, the second on your list, belongs to a friend of mine. He drives it to work now and again. He said it was a rare car, I just didn't realize how right he was. I found an 85 camaro with the clock in a junkyard this month and took the upper console. I grabbed it because i'm trying out a cup holder installation and that already had a hole in the right spot. (I'm using it to experiment with before cutting up my mint upper console with no holes). I held on to the quartz clock figuring someone might be looking for one for a restoration at some point. What a strange place that was to put a clock! you have to take your head away from the road and look straight down to your right and read an analog clock... why did they do this??? Did the stereo not have a built in clock at the time? wouldn't it make more sense to be mounted on the dash somewhere? The 85 Z28 I just picked up has a mint quartz clock that works and no cracks. If you want a pic, let me know. I may be wrong, but there would be no feasable other reason for the clock. I really like this site since I've always driven 3rd gens. I am just starting to rebuild a 1982 Trans Am I wrecked January first 2000 and didn't realize some rarety till I started looking for parts. Like an idiot I got rid of the pmd seats long ago because they needed redone and broke one of the Knight rider wheels but it isn't too bad because I had an extra set. Does anyone know how many 82 TA's came with the Super T10 4 speed or how many cars had a rear wiper and washer. I am just wondering because the defroster messed up but the wiper and washer nozzle still work perfect and I can't find a deck with the wiper whole anywhere. I guess I might have to swap windows. Sorry if any of this info was already on here if I missed it. I didnt see any numbers for the 1992 camaro Z03 cars. did i just skim too fast and miss them? 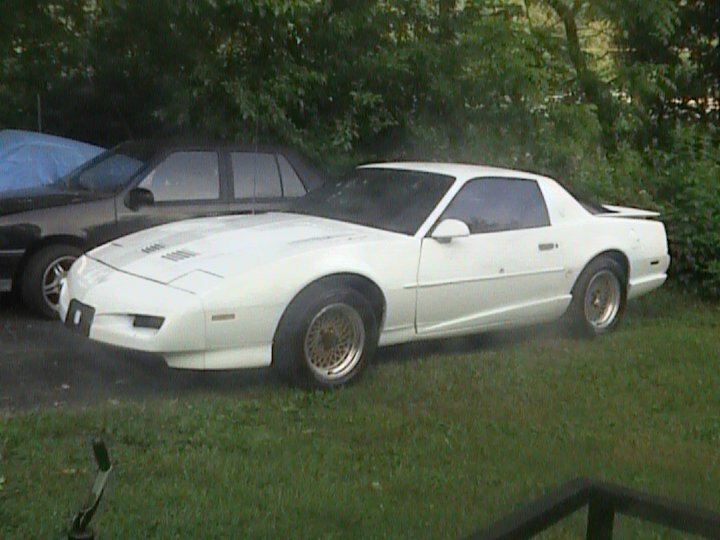 Hi, i have a 1988 firebird formula 305 TPI 5 speed manual, i know my car isn't the rarest on the this sit by all means, but i was wondering if my graphic's on the car came stock or if there just (home made) and/or just done at a graphic's shop.. i got some pic's but there not the best, Thank you for your time! wow.. i bought my first car 4 years ago; a nearly mint 92 L98 Trans Am for $700 because the fuel pump was out and the guy said it was too hard to fix.. and i sold it for 2200 after fixing it.. im truely upset, wow!! sh!#-fu(k-dam^ !! is 190 built considered rare? dang i screwed up i guess? OK,we have a 1991 GTA with the 305TPI auto with T-Tops. but what i think makes it odd and rare and probably not that desirable but just looking for opinions. it has the performance package deleted,and was set to current product engineering when new,for the first 1000 miles and then sold off at auction. so in a nutshell the only option it really has is T-Tops and the GTA package without the rear disc brakes,duel cats and oil cooler. i have the factory invoice from GM to back up the way it was ordered. Last edited by ta collector; 01-30-2011 at 04:25 PM. LOL, that describes my 1991 GTA perfectly. 305, AT, t-tops, single cat, 2.73 rear end. IMHO it's the least desirable GTA and it's not rare because most 305 AT GTAs came equipped like that. thats cool,was not planning on it being very rare,because it is a low mile car in super nice condition,just was curious is all. what color was yours?,ours is bright red with beechwood cloth. Last edited by ta collector; 01-30-2011 at 07:54 PM. I see 1988 GTA L98 listed twice. 6,913 U.S. hard top GTA L98 and 10,793 Formula, GTA & T.A. L98. I'm a little confused, can you explain? The data is what it is, The 6,913 number is from Frankie Rider's www.gtasourcepage.com page and he got his information from PHS. That data only shows the cars which were sold in the US, and does not account for GTA's which were exported. The 10,793 number is a total reported to Dealers from GM that did not break out the GTA, Formula and Trans Am. This number actually included Exported cars. I could not simply subtract the 6,913 from the 10,793 to get the remainder of 3,880 for Formula's and Trans Am's as it would be inaccurate. There are a few examples of this actually on the list... The list is as good as I could create with the available information right now. Out of the 6,913 HT GTA's built in 1988, what might be considered the 3-5 Top Options to look for in the RPO codes to increase rarity. SOooo... much thanks for the reference to that GTAsourcepage. I really do not know if there were any other options on the GTA as everything else I think was standard. I ordered a copy of my dealer invoice for my 92 camaro from GM Media Archives and they sent along a copy of some production numbers and other info for 1992 Camaros. I don't know if this is the right place to post it or if it is already posted somewhere, but I thought I would share it if anyone was interested. Nice addition with the 1992 info. Wonder what the 183 non standard colors were. Those look like scans from the Camaro White book. I've been told that a 15th Anniversary T/A with a T5 borg warner 5 speed is pretty rare.. anyone know how correct that would be? I've done some research myself, and found that only 500 were made with the 5 speed transmission. I'm assuming for a 20 something year old car that 500 is a pretty low number these days..
Last edited by danielsan; 03-14-2011 at 04:01 AM. The 15th anniversary TA in all original condition with the 5 speed is probably one of the more desired 1984's. You should have gotten the Recaro seating and the 5.0 HO engine, which is a nice addition, as well as 3.73 rear gears. You do not see many of them, some have been repainted without the blue stripes, other are just gone. Personally I like the look it was unique... Even at the Trans Am nationals, in Dayton you do not seem many of them.... I do not recall seeing any last year, but I might be wrong, I was rather busy. Anyone have a round about estimate of 1985-1986 Trans Ams with digital dash? I patrol the web looking for them, and keep track of them in a record I've started. So far I have 3 on the list, all 1986s, I've never seen an 85 T/A w/ digital dash. One of the 86's on my list sits in my garage, so I'm curious just how rare they were.